2012 Person of the Year: The Brave Faculty of Sandy Hook Elementary School!!! At this time of year, various media announce their person of the year. 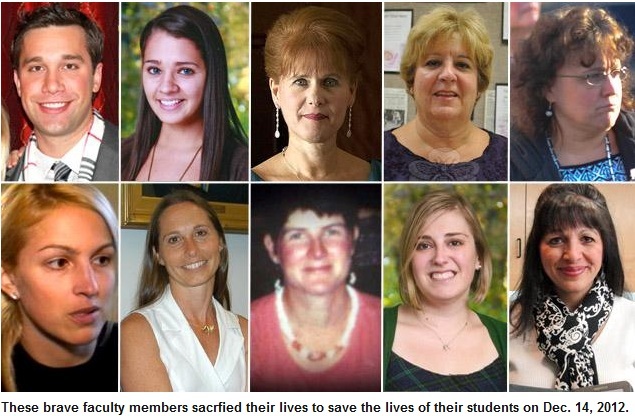 The New York Daily News awarded its “Person of the Year” to the faculty and staff of Sandy Hook Elementary School who gave everything — some their own lives — to to rescue students from the massacre that claimed 26 lives on December `4, 2012. We will remember them always! Unshackle Us from the Constitution! As we get ready to ring in the New Year, many of us are keeping an eye on the “fiscal cliff” discussions going on in Washington. D.C. As of this morning, negotiations did not look promising. Starting with the Obama presidency (2009) and especially in the past couple of years, there has been commentary about the dysfunction of our system of government and its inability to agree on courses of action. A good deal of blame for this has rightfully been directed at the partisanship that has come to supersede all other negotiation in the federal government. Louis Michael Seidman, a professor of constitutional law at Georgetown University, has an op-ed piece in today’s New York Times that directs our attention to the U.S. Constitution and begs the question: Should we “give up on it”? “…no one blames the culprit: our insistence on obedience to the Constitution, with all its archaic, idiosyncratic and downright evil provisions. Seidman goes on to provide examples in our history where the Constitution was at least bent if not ignored. Seidman makes sense but with what do we replace the Constitution? Also the elected officials who have brought the country to this state of affairs, are the only ones in the position to unleash the country from its constitutional shackles. How to Read in 2013: Advice from Ross Douthat! “First, consider taking out a subscription to a magazine whose politics you don’t share. Second, expand your reading geographically as well as ideologically. Even in our supposedly globalized world, place still shapes perspective, and the fact that most American political writers live in just two metropolitan areas tends to cramp our ability to see the world entire. Good advice but remember here in New York City we will be electing a new mayor in November!!! Education is a Process: It has a Beginning but no End. It Continues throughout Life. “that as we absorb the socio-economic values of our age, an age ruled by business, we have drifted away from what we in the educational community should be doing: teaching students to think, to see, to read, and to write. Education as a dwelling in the human experience of reality is ending. As with the Roman Empire, it is ending with a whimper, not a bang. The root of the problem is that we have absorbed the socio-economic and intellectual values of our age, an age ruled by business and science. The pragmatic values of business and science have become the values of our educational practices. Within these two orientations there is little understanding of and no place for the life enhancing studies of philosophy, history, literature, and the arts. Today we train students. A practical utility determines our thinking. “the fact that students are not getting educated is not their fault. They were weaned into these socio-cultural values. Students are not participating in their education. Students are being trained to live for goals and new electronic devices. Goals have become a narcotic that society accepts as education, which they are not. Education is not chasing a grade. It is not chasing a college or a job. If you do that you may get what you want, an “A” or a “B,” but you will never be educated. An education is a process. It has a beginning but no end. It continues throughout life. It is learning to see and think. As Bookstores Close – Libraries Seeing New Roles for Themselves! I am sure that many of you have noticed that bookstores are closing. Amazon as well as Barnes and Noble.com have taken their toll. However, the New York Times reports that the role of brick and mortar bookstores is beginning to be filled by public libraries. “As librarians across the nation struggle with the task of redefining their roles and responsibilities in a digital age, many public libraries are seeing an opportunity to fill the void created by the loss of traditional bookstores. They are increasingly adapting their collections and services based on the demands of library patrons, whom they now call customers. Cheryl Hurley, the president of the Library of America, a nonprofit publisher in New York “dedicated to preserving America’s best and most significant writing,” said the trend of libraries that cater to the public’s demand for best sellers is not surprising, especially given the ravages of the recession on public budgets. Nicholas Kristof: On Corporate Philanthropy – Needs to Do More Homework! Nicholas Kristof in his New York Times column today, looks at corporate philanthropy and has a “Gosh Darn Golly” moment while congratulating the likes of Ted Turner, Bill Gates and others for their generosity in recent years to various causes. Some of what he says is fine such as Ted Turner giving $1 billion to the United Nations Foundation to fight global poverty. However, when he praises Bill Gates and the Gates Foundation, Kristof has not done enough homework. Bill Gates made his fortune at Microsoft which for decades engaged in monopolistic practices, which spent hundreds of millions of dollars lobbying to secure tax loopholes, and has frequently made the yearly top ten list of corporations paying the least taxes. This is not to say that there are corporate-affiliated philanthropies doing good things but some of them are using money that should have been paid to the American government in the first place. In a sense, they are using the people’s money for their own glamour and glory. I have great respect for Kristof and his views but in this case, he missed something. Cloud Computing: Google versus Microsoft! In the early 1980s, I remember a feature article in Newsweek that had an illustration of two very large football linemen going head to head. One lineman represented IBM and the other AT&T. The article centered on the competition between these two corporate giants over development and control of data communications hardware and software that was emerging. It portended the future of digital technology replacing analog technology for data and voice communications. In today’s New York Times, there is a similar article but the two giants are Google and Microsoft and the technology is cloud computing. “As the two behemoths [Google and Microsoft] slug it out in the enterprise market, their cloud-computing software is changing the way businesses operate. Internet-based computing makes it easier to communicate both within and outside a company. Fixing software and adding features can be done automatically, the way consumers get the latest version of Facebook when they go to its site. It is my opinion that the future of digital technology will reside in the cloud. As the article mentions, we are still in the early throes of the cloud phenomenon and certain aspects of it especially pricing are difficult to predict or even get a handle on. IT professionals would be wise to keep current with what the cloud offers and how it evolves. 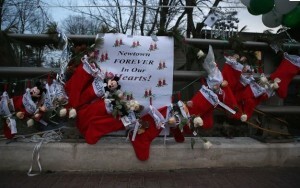 Peace on Earth/Good Will to All – And Remember the Innocents at Sandy Hook Elementary School! For the past several years, my daughter, Dawn Marie, her husband Bruce and grand kids, Michael Anthony and Alissa, spend two weeks with Elaine and me for the Christmas holiday. This year my daughter felt the need to visit Newtown, Connecticut. She took with her a poster with messages from friends and colleagues where she lives and works in Poulsbo, Washington. The messages expressed condolences and support for the families of the victims of the tragedy at Sandy Hook Elementary School. This holiday we all join in remembering and offering our support to the Newtown community. Gap between Rich and Poor Widening for College Completion! The New York Times featured article yesterday focused on the four-year college completion rates between rich and poor students. It followed the post-secondary careers of three low-income students from Galveston, Texas, who wanted to do something “better with our lives” and saw a four-year college degree as the vehicle. All three did well academically in high school and enrolled in an Upward Bound program designed to prep them for a college career. Angelica was headed to Emory University, Bianca enrolled in a community college, hoping to later enroll in a university, and Melissa left for Texas State University. Four years later, their story seems less like a tribute to upward mobility than a study of obstacles in an age of soaring economic inequality. Not one of them has a four-year degree. Only one is still studying full time, and two have crushing debts. Angelica, who left Emory owing more than $60,000, is a clerk in a Galveston furniture store. The article provides important insights for American higher education especially for public institutions that generally admit large percentages of poor, first in their family to attend college students. Backlash to NRA: Wayne LaPierre a “Lobbyist for Mass Murderers”! As the last of the innocents were buried yesterday in Newtown, Connecticut, the media backlash against the NRA and its spokesman, Wayne LaPierre was furious. At a press conference on Friday, LaPierre blamed everybody except his own organization for the proliferation of guns in this country that resulted in the tragedy at Sandy Hook Elementary School. 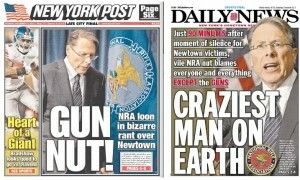 The New York Daily News front page referred to LaPierre as the “craziest man on Earth”. 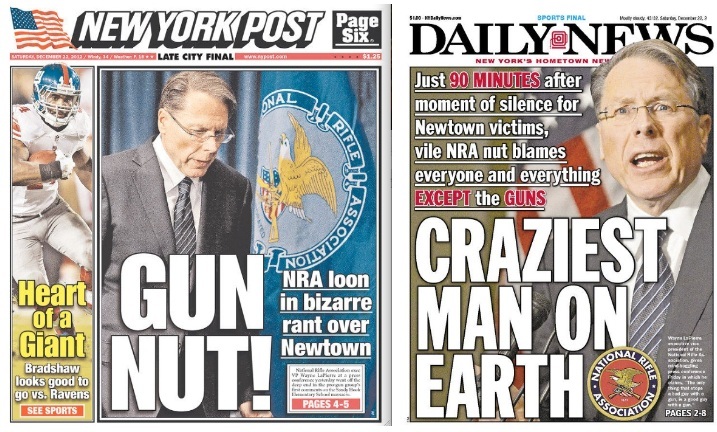 The New York Post, a newspaper generally friendly to the NRA, had a front-page referring to him as a “gun nut” and a “loon”. Perhaps the most pointed condemnation came from Lawrence O’Donnell on his MSNBC program, calling LaPierre a “lobbyist for mass murderers” and denouncing him for attempting to take issue with the media’s coverage of the slaughter in Connecticut.